France being so close to Italy, we share a culinary heritage. Among the many things we eat on both sides of the border, is Polenta. Polenta, a dish made from boiled cornmeal, did not enjoy a great reputation in France until recently as it was for a long time a peasant dish. My husband's maternal grand-mother spent a lot of time in the Alps (ie, close to Italy) where a lot of Italians emigrated to escape poverty. They brought Polenta with them and as a result, my husband's grand-mother made Polenta a lot. She calls it la polente... and if you ask my husband about la polente, he does not make a happy face (to say the least). For his grand-mother would make a soupe a la polente : she would mix milk and Polenta together and serve it as a liquid soup (yes, I know, I would not make a happy face either!!). In my family, my mother would occasionally make Polenta as we know it today : thick and creamy and we would eat it with ratatouille. This was not my favorite dish but not something I could not eat either. I had my best culinary experience with Polenta while living in San Francisco. My best friend M. took me out for dinner one evening to celebrate her birthday. 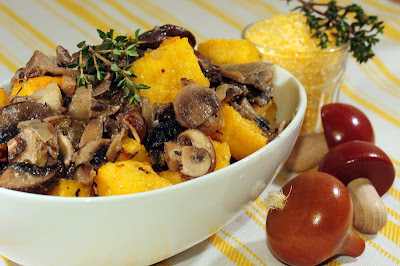 I chose Polenta with creamy mushrooms... and it was eye-opening jaw dropping good! To this day, I still think about this dish everytime I have polenta for I have not been able to reproduce it myself (but that's why I am no professional chef!). 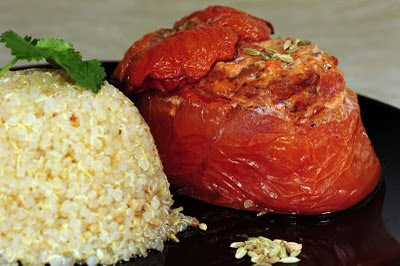 On a day like today, Tomates Farcies (stuffed tomatoes) seem the perfect thing to have. Yes, I know, eating fresh tomatoes in Philadelphia in the middle of Winter is not eating "local"......but tomatoes are in season in Florida, so I'll just say that they are as local as can be at this time of year! Tomates farcies is a very traditional French dish that some families only serve in the Summer (when tomatoes are in season). BUT if there is something I don't enjoy it's tomates farcies in the Summer. Because, somehow, even though les tomates might be de saison, the whole dish is hors saison. See, tomates farcies is a warm dish that would totally fall into the "Comfort Food" category. I CAN NOT turn down a good bargain on leeks! Leeks (poireaux) are a staple of French diet. 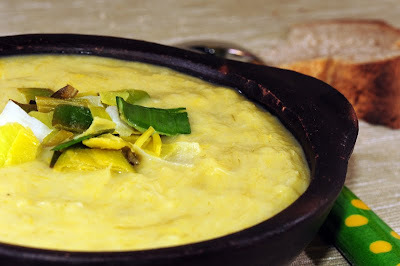 There are poireaux in (almost) every potage de legumes that a French family can make; they are a delicious side-dish in fondue de poireaux; when young, we just eat them cold with vinaigrette, etc. To the point that you don't even write them down on your grocery list anymore. It's a given. You purchase leeks automatically. As a result, the basic of supply-demand economics make them very affordable when in season. My grand-mother, like 90% of French people with a vegetables garden, used to grow some in her potager. Evidemment! And inevitably, she would give us some whenever we were heading back to Paris after a stay at her house. My older brother could not stand having leeks in the car because when kept in a close-and-somewhat-warm environment, leeks don't smell that great (they are related to onions). I agree but it never bothered me that much. It did bother me that it bothered my older brother because it meant that we had to drive with an open window in the Winter cold days so that he could get pass this smell. So me and my younger siblings were shivering in the back because my older brother had a leek-sensitive nose! Merci bien! That said, his aversion for leeks (or their smell, really) was never strong enough to deter my grand-mother to load our car with poireaux (and other less smelly fruits and vegetables.) Certainement pas!We would just leave them by the car and load them at the very last minute! Moving to the US, it was quite a shock to discover how much leeks cost here. I had meant to make meatballs to my children for a while. Meatballs are not something I cook often. I don't know why because they are really fast to make and always a hit with my children. I wrote the other day that we don't go out a lot. That's true. On the other hand we tend to entertain (recevoir as we say in French) a lot . Or, to be more accurate, I tend to recevoir during the week while my husband is still at work. I have come to have my friends and their children over for a late-afternoon playdates, especially in the Winter when getting together au parc is not an enticing option. Since I feed my children early (because my older one is on her school schedule and requires a lot of sleep), I always offer to feed my friends' children together with mine on a week night. On Fridays, another friend generally comes with her children after school and we only have the goûter together. When I cook dinner for three or four kids, I try to make something easy that all children would enjoy and that would be different from what my friend's children would eat at home. Juste équilibre but so far so good. It's always a pleasure to see other children eat what I cook for mine. The more I cook, the more I look for recipes on the web, the more I get frustrated because most of them are not printable. When I want to make a recipe (that is not printable, that is), I jolt down the ingredients on any (really, any) piece of paper available and then I use it in the kitchen... but most of the time, I come back to my computer to look for additional directions I did not write in the first place. Evidemment! If I like what I am cooking (le plus souvent) and if I make modifications (très souvent), I write it on this tiny piece of paper...and I leave them behind me until I am able to find the time (presque jamais) to write them in draft mode on my computer. Only I can remember what the few scribbles on the tiny sheet of newspaper are for... and yes, I do admit that if it has been too long, I don't even remember what I made with 3 cups of flour, 2 cups of milk and 1 teaspoon of Vanilla Extract (sounds yummy, though, n'est-ce-pas?). Anyway, having a printable version of recipes would not mean that I would not leave my pieces of paper behind... but at least, we'll all remember what they are for. Sure, it would not save trees but it would save my computer (and the path between the kitchen and the computer) from being covered with flour, butter, chocolate, or tomato sauce!! And since my guess is that most of you do the same, all our computers would be better off with a printable version of the recipes. 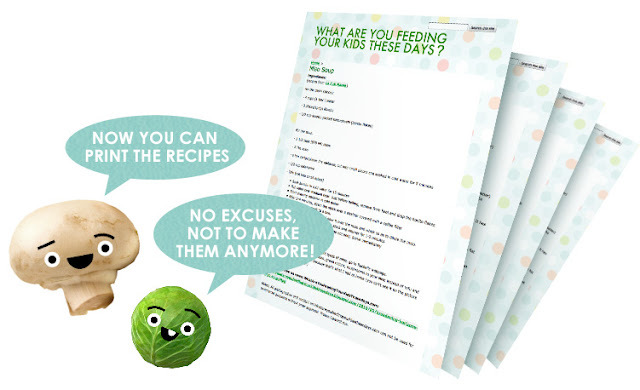 Besides, with printable versions, you won't have any lame excuse not to cook! So, just to make you cook more and avoid computer accidents, most recipes are now printable!... You are welcome! Please, just bear with me as I steadily modify all of them. It will get done eventually! Bonne cuisine! When I used to work in Paris, I was traveling to England a lot. I always loved to travel (some) for work as it gave me an extra opportunity to discover places I had never been before (but who on earth want to do tourism in Basingstoke, dites-moi?). On some occasions, I could also meet up with friends living in London and that was always a plus. One thing I came across while in London was the Prêt à Manger delis. They had the best fancy sandwiches ever (back then) and it was a compulsory stop for me. I would particularly love their crayfish (écrevisses in French) sandwich with fresh arugula. I would get it often and would enjoy every bite of it! When I moved to the US, I was happy to discover that they were actually opening locations in New York City. Not that we lived close to New York City (Upstate New York feels VERY far from New York City). But somehow, it made me feel better. Unfortunately for me, they did not offer my favorite sandwich. I do remember reading that one of their main challenges was to make New Yorkers love crayfish! 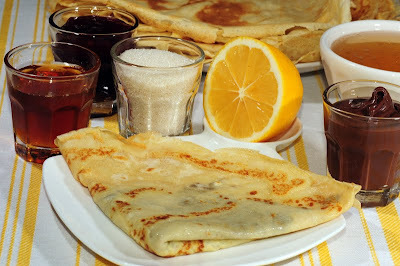 French people eat a lot of both sweet and savory crêpes (savory crêpes are called galettes and made with buckwheat flour). If you go to Britany, or places where a lot of Bretons moved to (like close to the Gare Montparnasse in Paris), you'll be able to find crêperies: restaurants dedicated to crêpes: any kind of crêpes you can think of, but just crêpes (and maybe a salade to go with them). It is also traditional to drink apple cider (cidre brut ou doux), not wine with crêpes. My grand-mother used to make her own cider in her house in Normandy. It was part of the annual ritual and she could not even think of missing the day when cider had to be made. C'était sacré! Organic Milk vs. Non-organic Milk? At my daughter's one-year well check-up, the pediatrician advised me to strop feeding her formula and to switch to whole milk instead. I had not put any thoughts into it until she told me that. You see, in France, you don't switch children from formula to whole milk immediately. You have another in-between milk that is made for children age 1 to 3 years old : le lait de croissance (or growth milk). Pediatricians in France do not condemn giving whole milk to children one-year and older; they just advise to make really sure that children have a balanced diet to guarantee the proper intake of proteins, vitamins and oligo-elements. Lait de croissance makes it easier on families since it solves that problem. Yet, as usual, you have to accept to pay the price for that : lait de croissance retails at higher price than regular milk (about 2 euros/litre for lait de croissance vs. 1 euro/litre for regular milk and 1.8 euro/litre for organic milk*). Is lait de croissance a brilliant marketing idea or are there scientific explanations. Here is what I found...and how I dealt without lait de Croissance in the US. We are in the middle of a snow storm in Philadelphia. Encore!... and even though I generally enjoy snow (the city gets quiet; everybody is friendly,...), I did not feel like leaving my place today because it really felt like blizzard. While I would have enjoyed staying in bed with a good book and large cup of coffee (when was the last time I did that??? Hmm can't even remember!! ), I had two young children to attend and entertain! All of a sudden, with no playdate, no outside activity (too much blizzard), the day ahead seemed VERY long... Fortunately, with some projects (sewing, singing, play-doh, cooking, reading, taking the garbage out to the end of the long (very long) hallway), a long nap (them, not me!! ), we made it and had a great day! I love sushi and don't eat enough of them. I used to purchase rolls (yep, I don't make them!) to share with my daughter when she was younger but she was never a big fan of seaweed. I therefore stopped buying them; I only treat myself (my husband likes them but not as much as I do) for special occasions. One thing I enjoyed when going for sushi was having a Miso soup. But then again, it tastes like the Miso soup you pay $$ for is processed. In other words, I could purchase the same (if not better) at a local supermarket and make my own for less money. So, I stopped ordering Miso soup when going for sushi. 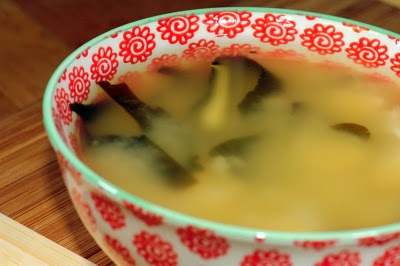 Then, reading La Fuji Mama blog on Miso soup totally changed my perspective. You are all familiar with traditional French dishes: Quiche Lorraine, Boeuf Bourguignon, soufflés au fromage, and now Gougères, etc. The reason is that they are offered in the US with some/or no variations. 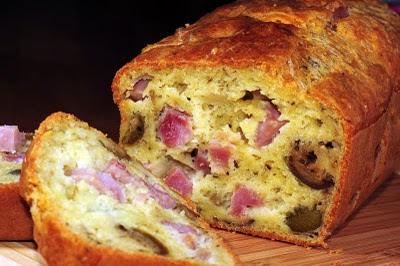 One dishI have not encountered a lot (if any) here, although there are very common in France, are Cake salés (savory pound cakes). We use the English word "cake" in French to describe a loaf-shape pound cake traditionally made with eggs, flour, sugar,and fruits. 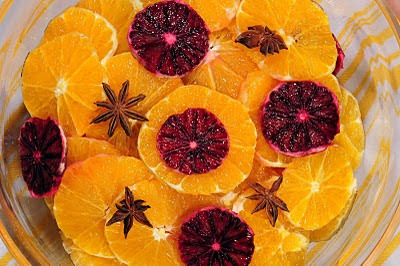 The most common ones are the Cake aux Fruits Confits (candied fruits pound cake) and Cake au Citron (lemon pound cake). More sweet versions have been added : cake au chocolat, cake aux amandes et fruits rouges (almonds and berries pound cake), etc.... More interestingly, savory versions appeared in the mid-eighties.. and stayed. 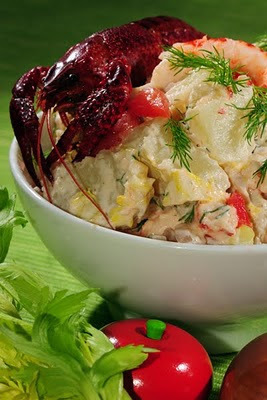 A Cake Salé is generally made in the Summer to bring along to a pique-nique or to eat as an entree for lunch/dinner along a big salade. French people love them and I was surprised that with the American tradition of eggs-for-breakfast and brunch, I had not seen many Cake Salés in the US. 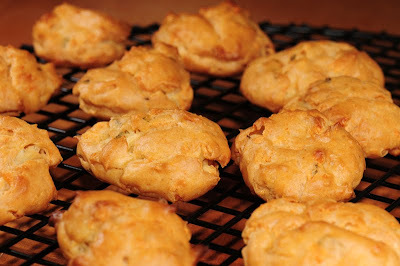 Gougères (aka Cheese Puffs) are a favorite of mine. My mother would make some for us on a week night. 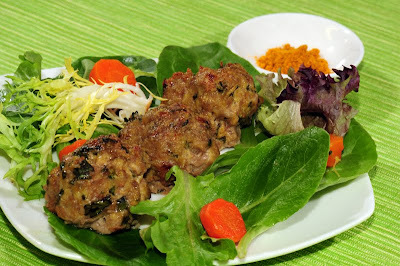 We would eat a few small ones (or a big one depending on the size) for dinner together with a green salad (and generally after a bowl of freshly-made soup). I can't tell you how much I love gougères . I had almost forgotten about them (I am ashamed to say it)... until I saw some featured in a French cooking magazine a few weeks ago. It hit me right back. My mouth started watering and I made my first batch that same day.